Costa Rica aims to take over from Panama as the leader in tourism for business meetings and conventions, a sector valued at US$11 billion a year. Promotional campaigns, ambassadors that promote the country all over the world and the strengthening of the Convention Bureau are some of the main strategies that seek to wrest the leadership from Panama. The Central America convention market is led by the ‘canaleros’ (Panamanians), but Costa Rica is looking to climb ten positions in the ranking of the International Association of Congresses and Conventions (ICCA). To achieve this, the creation of the Centro Nacional de Convenciones (National Convention Center) was vital, which will open its doors on April 5 and will complement the work that the private sector has done to place the name of Costa Rica in this niche market. “Costa Rica is late to the table compared to other countries, but it has a name, a well-received brand in the world: for 30 years it has positioned itself in the tourist market. Today is a leader in sustainable tourism recognized by the World Tourism Organization, with these credentials we formally enter the tourism of meetings,” said Mauricio Ventura, Minister of Tourism. The minister explained that it has been working for about two years on promotional campaigns and participation in specialized fairs, both in America and in Europe, to capture the market. Last year at Feria Fiexpo, held in South America, Costa Rica received the most important award for its approach as an important player in convention tourism. The creation of the Convention Tourism Ambassadors Program (Programa de Embajadores de Turismo de Reuniones) is a tactic that will place Costa Rica on the conventions map, according to Ventura. This program was launched last year and seeks to involve institutions and associations. Currently, there are more than 100 trained ambassadors. 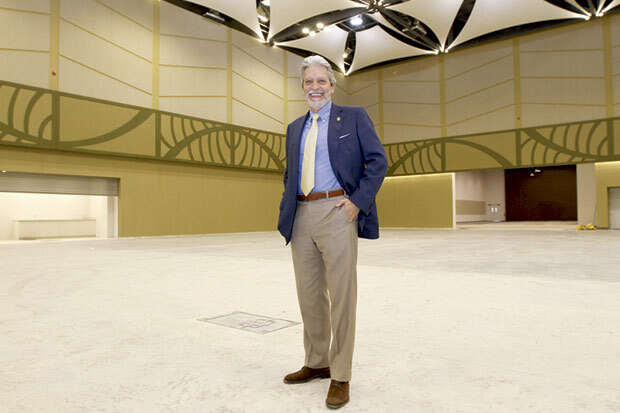 “With the Convention Center, the convention tourism situation will change from meetings that were isolated efforts of some entrepreneurs to a national strategy, to a country effort,” said Ventura. The minister was emphatic that the national plane does not aim to take away the convention market from hotels or other sites that host these events. The first event following the April 5 inauguration is the Expotur that will be held on April 25. The Centro Nacional de Convenciones is a 15,600 square meters (168,000 square feet) building on 10 hectares fronting on the Autopista General Cañas, across from Los Arcos, east of the Cariari Plaza, some 8 kilometers from the Juan Santamaria (San Jose) international airport. The investment totaled US$35 million dollars. It has a capacity of 4,600 people. It can be divided into 16 meeting halls.